In the 1970s, guitarists became obsessed with coaxing the maximum sustain from their guitars. While these guys were fannying around with overwound pickups and chunks of brass hardware, a young guitarist called Greg Heet answered their collective prayers with a little J-shaped handheld device called an EBow. In the words of its inventor, the EBow (aka 'energy' or 'electronic' bow) "focuses a sympathetic oscillating magnetic field on a single string and causes it to vibrate". Using an EBow, a skilled practitioner can pull the sound of a violin and cello from any electric guitar. That's not all. With a little practice, you can replicate the tone of a harmonica, a flute, orchestral horns and synthesized strings. As Stuart Adamson and Bruce Watson of Big Country proved in the 80s, the EBow can even conjure up an uncanny simulation of bagpipes. Check out Phil Keaggy's EBow-driven version of Amazing Grace on YouTube to hear the same beautiful effect. 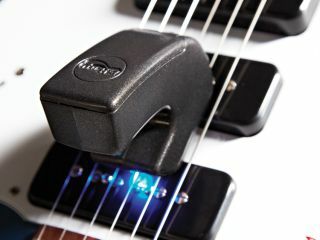 Unlike other infinite sustain devices (the Fernandes Sustainer, for example), the EBow only works on one string at a time. It has two grooves set into its body to rest on the strings either side of the one you want to vibrate. Now that may seem like a limitation, but the fact that the EBow is held like a pick allows the player to produce lightening-fast arpeggios by sweeping it across the strings. The EBow made its first public appearance at the 1976 NAMM Show in Chicago. After 20 more years of tinkering, Heet further boosted the tonal versatility of his invention when he unveiled his fourth generation PlusEBow in 1998. The new development offered a switchable higher secondary harmonic mode, meaning it sounds like a sustained pinched harmonic. Today, more than 30 years after it was first launched, the EBow still has infinite appeal. The Edge employed the EBow's incredible sustaining qualities on U2's 1984 album, The Unforgettable Fire, Noel Gallagher used his EBow on the Oasis classic, Don't Look Back In Anger, and you'll also hear it on material from Van Halen, Red Hot Chili Peppers, Smashing Pumpkins and Duran Duran. As these guys know, nothing else produces good vibrations in quite the same way.